Porgy (m. Jimmy McHugh, w. Dorothy Fields) — The song “Porgy,” copyrighted in 1928, was written by McHugh and Fields for the hit Broadway musical revue Lew Leslie’s Blackbirds of 1928. The show originally opened on January 4, 1928, under the heading The Blackbird Revue at Les Ambassadeurs Nightclub in New York, before transferring in May 1928 to the Liberty Theatre on Broadway, where Lew Leslie changed the shows [sic] name to Blackbirds of 1928. The original Broadway production opened at the Liberty Theatre on May 9, 1928, where it ran for 518 performances, becoming the longest running all-black show on Broadway. It was directed by producer Lew Leslie and starred Adelaide Hall, Bill Bojangles Robinson.Aida Ward, Tim Moore, Blue McAllister, the Blackbirds Beauty Chorus and the Famous Blackbirds Orchestra conducted by Felix Weir. Also in the cast were Johnny Hudgins, Elisabeth Welch, Mantan Moreland, Cecil Mack, and Nina Mae McKinney. Orchestral arrangements were by Will Vodery. 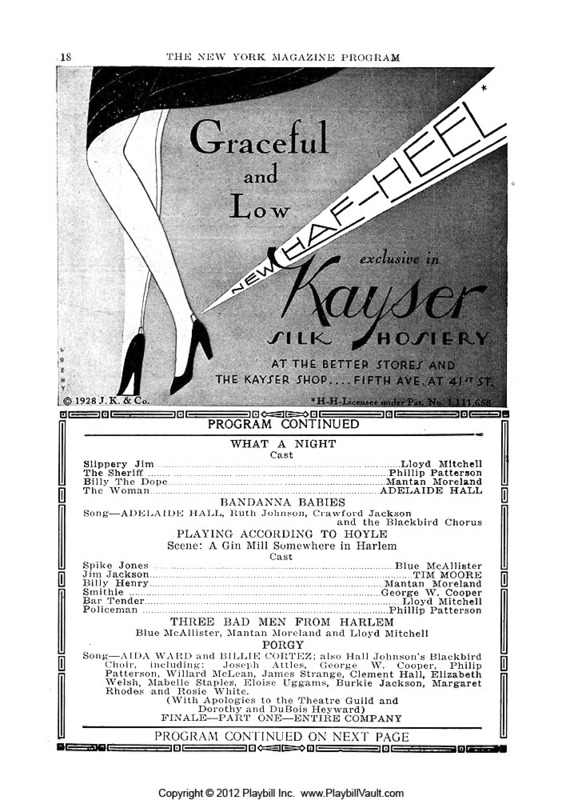 Playbill.com provides a copy of a program for the revue in the “Inside the Playbill” section of its Blackbirds of 1928 page. The program appears, with pages in reverse order, in a slideshow titled “Inside the Playbill: Blackbirds of 1928 – Opening Night at the Liberty Theatre.” On page 18 of the program the credits indicate that the “Porgy” number is performed by Aida Ward and Billie Cortez, with Hall Johnson’s Blackbird Choir. Members of the choir include Joseph Attles, George W. Cooper, Philip Patterson, Willard McLean, James Strange, Clement Hall, Elizabeth Welch, Mabelle Stapes, Eloise Uggams, Burkie Jackson, Margaret Rhodes and Rosie White. In another copy of a program for the revue available at WorthPoint.com, the credits for the “Porgy” number appear on page 19 (see above). The only difference in the credits for this number in the second program is that the choir is named Cecil Mack Blackbird Choir. See my transcription of the lyric, here: Porgy (Fields & McHugh), 1928 – lyric. Following a 16 bar verse, the chorus is 72 bars long, with nine sections, eight bars each. In the 32-bar or AABA song form most common during the classic American songbook era, a song with 64 or more bars of chorus typically has a second part of the chorus with the same structure as the first: (1) AABA, (2) AABA. The words will be different in the second part, but the music will be essentially a repetition of the first part. That’s certainly not the case here. Instead the structure of the chorus is something like AABA CDEF A. An alternate take (take 1) was released on the 1988 CD reissue of the album, and also included on the compilation album La chanteuse de jazz idéale, released in 1996 in France on the Wea Music label. 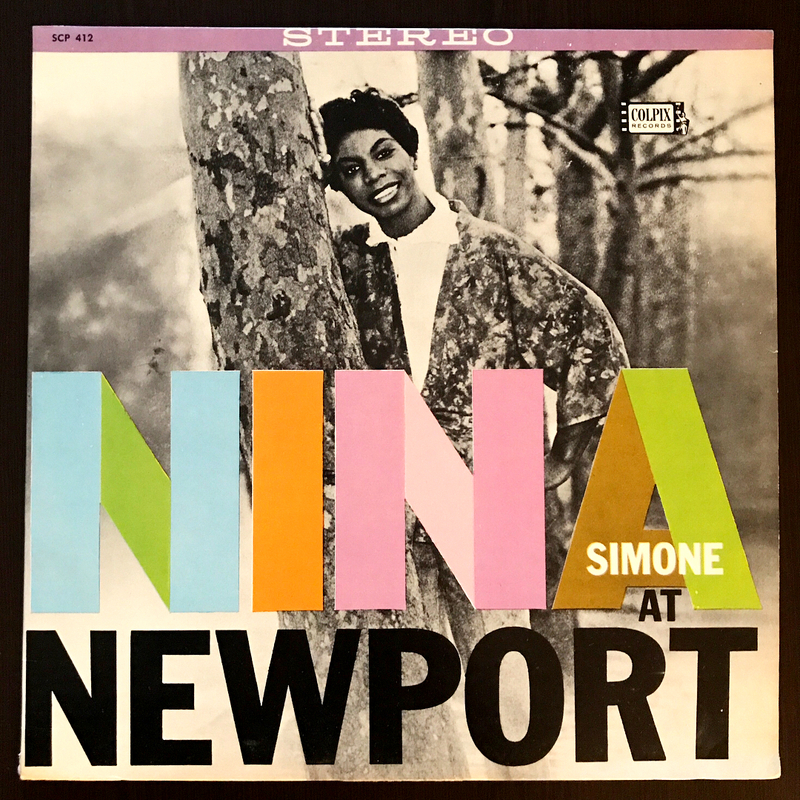 Nina Simone — recorded at the Newport Jazz Festival, 30 June 1960; originally issued on the 1960 album Nina At Newport, Colpix Records CP 412 (Mono) SCP 412 (Stereo) — For unknown reasons, some pressings of the album give the title of the song as “Blues For Porgy” on both the back of the album cover and the label. * The Discography of American Historical Recordings indicates that two masters of Columbia matrix W150159 were made, drawn from the first and second of three takes on 1 April 1930 in NYC. On the Columbia 2184-D page, DAHR suggests that each of the masters were used to create separate pressings of the single with that catalog number.